The Cross Country team has been keeping busy! On August 28, they participated in the Holy Trinity Early Season Showcase. Brendan L. placed 19th and Carson C. 23rd out of 122 varsity boys. The team finished 5th out of 16 schools. For girls varsity, Sara S. finished 15th out of 87. For JV boys, Chad L. finished 28th out of 80 runners. 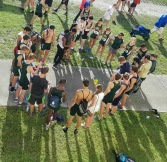 This past weekend, they gave their all at the Viera Invitational. Chad L. and Matt D. finished 1st and 2nd for JV. Congratulations Hustlers!